What is behind the Internet-of-Things buzz? How do we get rid of power cables and batteries in our electronics? How do we bring the limitless green solar energy of space down to earth? These are the questions that drive our Wireless Power research in the group, which has blossomed into one of our most-recognized bodies of work. 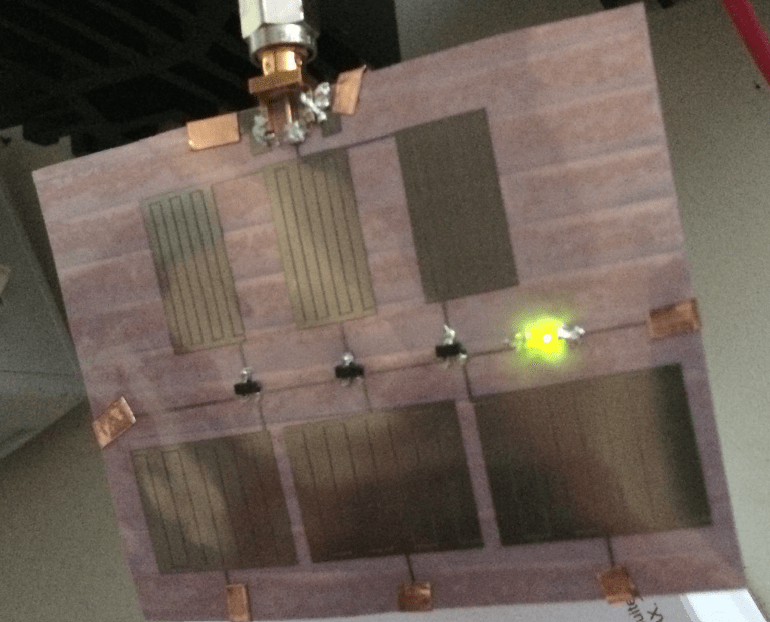 A great overview of wireless power can be found in Christopher Valenta’s survey article in IEEE Microwave Magazine, which won the best paper award for the magazine in 2015. 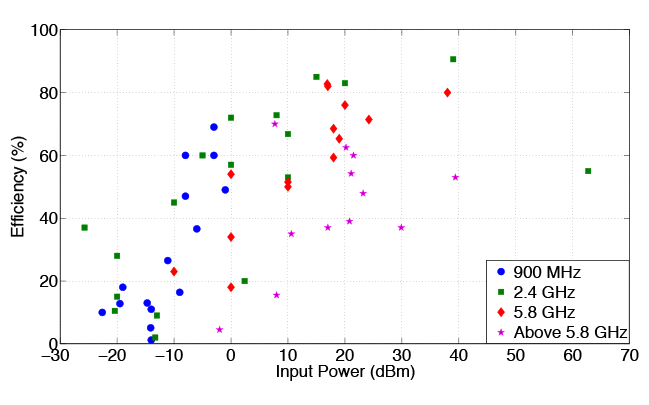 Plot of conversion efficiency vs. RF input power level for numerous rectifier circuits reported in the research literature from UHF to upper microwave frequencies. There have been numerous original inventions and discoveries along the way. 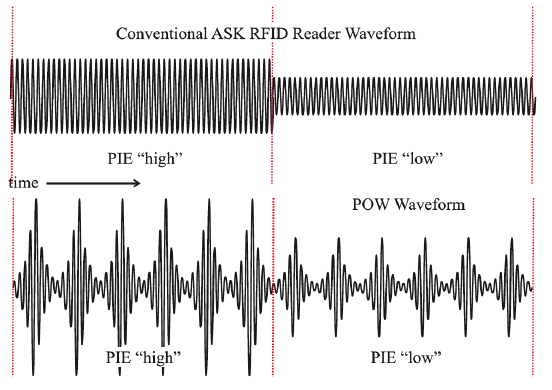 Matt Trotter’s key paper on Power-Optmized Waveforms demonstrates how radio waveforms can be changed to enhance wireless power conversion, particularly at low power levels. Example of a continuous-wave (CW) signal and a power-optimized waveform (POW) — a band-limited signal that dramatically enhances diode conversion efficiency and output voltage at low power levels. 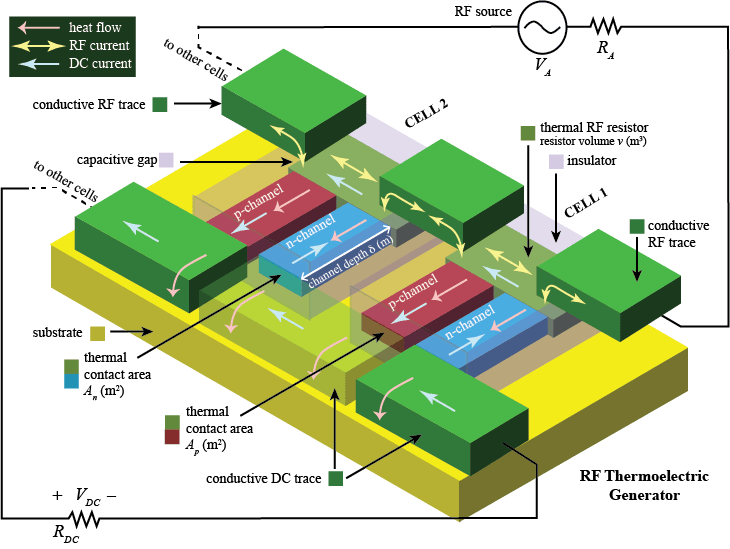 Another key accomplishment was the invention and analysis of the RF Thermoelectric Generator — a nano-scale theoretical device that can be shown to convert power more efficiently than conventional semiconductor diodes. The paper also works out what is believed to be the fundamental thermodynamic limit for nonlinear electrical signal conversion. This work won the best paper award at IEEE RFID 2016. Diagram of an RF Thermoelectric Generator (RFTG), which converts RF to DC more efficiently than conventional diodes. Prof. Durgin also chairs the Microwave Power Transfer workshop for the Space Solar Power Institute, which studies the use of microwave power beaming to transfer solar power from space to earth. Test rectenna circuit on a transparent substrate harvesting 5.8 GHz microwave radiation and lighting up an LED. Such devices could make low-cost rectenna farms on large swaths of land for space-solar power collection. In 2013, Georgia Tech was chosen to host the William Brown Fellowship by the family of Bill Brown, in recognition of the continuing student excellence in this field.